We observed in Section II.3 that the Couette flow could lose stability in two different ways when the Reynolds number is increased, depending on the value of the other parameters, namely, the critical eigenvalue can be zero or purely imaginary. The crucial fact for bifurcation analysis is that the differential equation (II.34) is invariant under the representation of the group Γ = O(2) × SO(2) defined in Section II.4 and that, owing to this symmetry, the critical eigenvalues are double (see Remark 1 of Section II.3). These algebraic properties completely determine the number of branches and the pattern of the bifurcated solutions. The group-theoretic approach to bifurcation with symmetry can be avoided in our problem because the group action is quite simple. 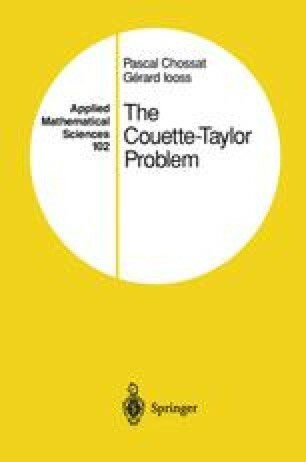 Readers interested in this algebraic approach should consult [Go-St-Sc], where they will also find many references. For the primary bifurcation analysis the azimuthal symmetry plays no role; the types and number of solutions would therefore be the same for a problem with eccentric cylinders, for example (see Chapter V). However, we will need this symmetry to explain the spatial structure of the flows. In this chapter we successively review the steady-state and Hopf bifurcations, describing first the theoretical analysis, then the actual bifurcation diagrams occurring for different values of the parameters, and finally the physical meaning of these solutions (structure of the flow).